Goro Miyazaki's anime adaptation Ronia the Robber's Daughter tells a story of familial love and bonds of friendship. Studio Ghibli's foray into a TV anime series will begin with Ronia the Robber's Daughter, an adaptation of the Swedish fantasy book for children. Directing will be Goro Miyazaki. Goro Miyzaki is Hayao Miyazaki's son, and he's already directed a couple Studio Ghibli films, Tales from Earthsea and From up on Poppy Hill. Ronia the Robber's Daughter will be both his first time directing a television anime series and Studio Ghibli's first television series. The anime is based on the book of the same name by Astrid Lindgren, who is best known for her book series Pippi Longstocking. 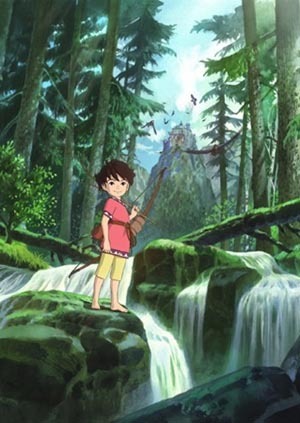 Ronia the Robber's Daughter revolves around the daughter of a chief of bandits who live in a castle within a forest. Ronia studies the creatures of the forest, but the story is more than a coming of age tale. "Ronia the Robber's Daughter is a story not just about a girl who grows into adulthood, but it is also a story about the love and growth between a parent and child, and a story about the bonds between friends," Miyazaki said. "My goal is to create a work that everyone, from children to adults, will be able to enjoy." The anime adaptation of Ronia the Robber's Daughter will air this fall. The book was first published in 1981 and has seen film, musical, and stage adaptations.